Why would it irritate me? Well…it would irritate me if someone were to purchase a firearm that they have no idea how to shoot it. Not that they couldn’t take lessons, it is because some of them never take lessons and maybe only shoot it once. Hollywood always glamorize everything and companies will always attempt to market their items to sell, that is called business. But a gold pistol? Really? Who are they marketing that towards? The pistol in question is the desert eagle .50. For one thing, you better have a lot of land to fire that pistol because no outdoor range that is structured would take the chance of having their backstop torn up or have a stray .50 cal round go traveling over their land, into a neighborhood. Could you imagine the liability? I have taught many people that told me that they have owned a pistol for many years, never fired it, never took it out until their kids begged them to get lessons. One woman in particular bought a firearm because her friend took her to a gun show and told her to buy a specific pistol. The woman bought the pistol and it stayed in her purse for 6 years, never cleaned, never fired, never touched. When I took this woman to the gun range, I actually had her son try to put a bullet through the barrel and it jammed immediately. I oiled it up and we tried again. It malfunctioned again. I then told her to sell the firearm to someone that could use it. 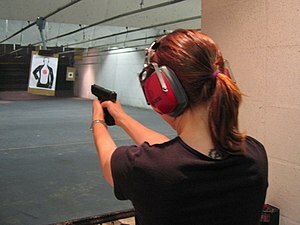 The action was so hard that the woman would not have been able to chamber a round if she needed to. That would/could have cost her, her life. Why take the chance. 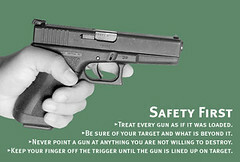 It is not that hard to gain the information about firearms or to find a local range that provides lessons to the public. Don’t go by what Hollywood throws at you on the big screen because real life can be much more painful if you don’t pay attention.